​Living downtown is incredible – everything is nearby. We walk to the grocery store and take transit to doctors appointments. Anything that we can’t get to in 45 minutes isn’t worth getting. That said, it isn’t without its downfalls. Busy streets and sidewalks are difficult to navigate, and crowded events are just a write-off for strollers. Tied with the opportunity to be close to your child and still have your hands free, there’s no question – baby wearing is the way to go! He’s in there… somewhere. The Infantino wasn’t ideal for the first few weeks due to T’s low birth weight. There are so many options for carriers, but at the end of the day whatever your baby fits in is the one that works best. The problem is babies don’t stay the same size for long. Wraps tend to have the advantage over carriers for the flexibility of carrying styles which grow with your child. K opted to go with the Baby K’tan, which I’ll get her feedback on later. For me? 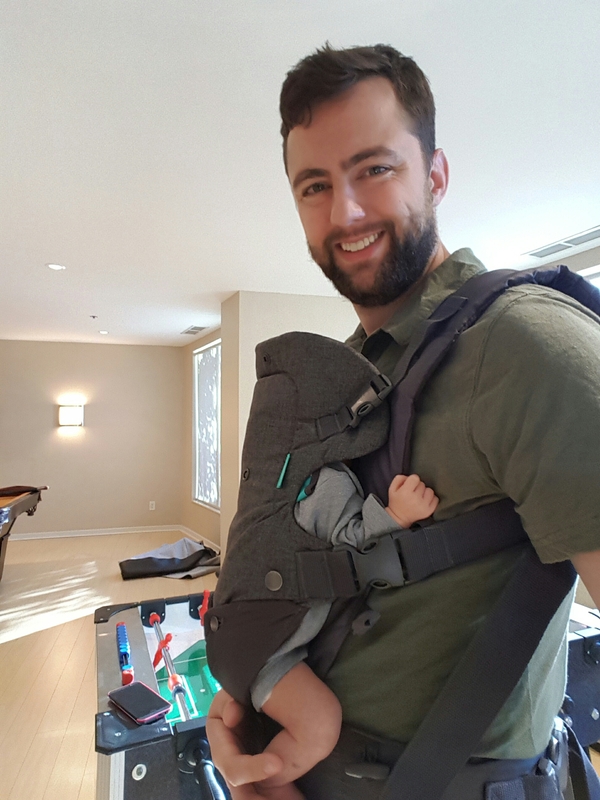 Clear choice, I needed the structure and support of a carrier, but I wanted the options on how to use it and the potential to grow with the Wee Baby T. The Infantino flip Advanced 4-in-1 Convertible Carrier checks all the boxes, and is a great deal too! This is probably the most practical thing we put on our registry. After an initial struggle with T’s low birth weight, I’ve used the Infantino every day. It makes local travel and long walks a breeze. Even just working around the house, I love having a second hand to fill the kettle, clean the counter, or use my camera. I’ve worn this (with T in it, obviously) for about 2 hours consistently with no pains whatsoever, seemingly for either of us. Geared up to take the dog out. 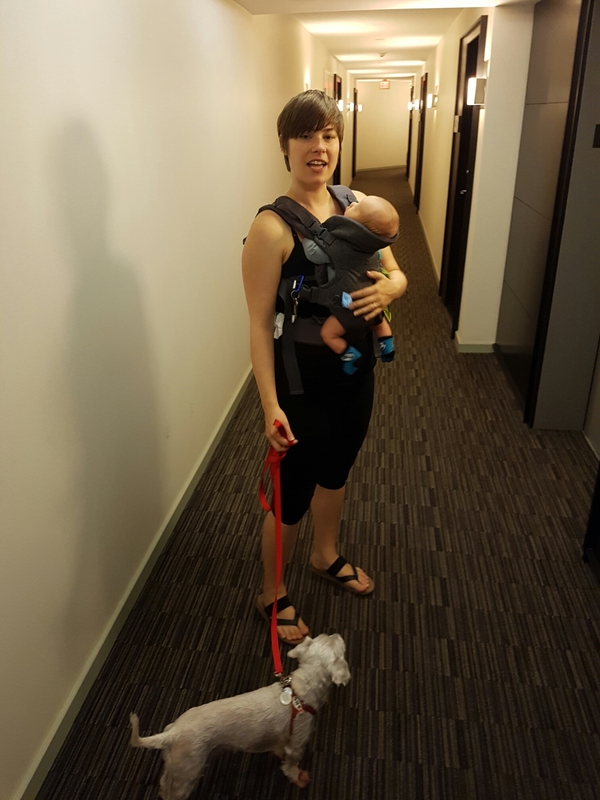 K typically uses the Baby K’tan, but she wanted to give the Infantino a try too – no problem adjusting the fit. The straps (of which there are many) make the Infantino incredibly customizable for a snug fit and are easy to reach for on-the-fly adjustment, but for the most part once you get it set you should be good to go. Infantino could have done a better job with strap management though; sometimes it can get frustrating trying to get everything tucked away nicely. There is a band to keep the waist strap nicely contained, but nothing for the back or chest straps. Right now I’m using binder clips to hold everything nicely out of the way. I suppose the greatest measure of practicality is can you comfortably transport and carry your baby hands free for long periods of time without them complaining. Absolutely. T loves this thing and typically falls asleep before we get on the elevator to leave. Right from the start I was amazed when I opened the box. The carrier is solid and durable through and through – the stitching, buckles, and fabric all exceed my expectations. There is plenty of padding in the shoulders and belt, and the straps tuck away nicely and don’t rub when you wear it. When I put T in I could really feel that each clasp was secured as I clipped, snapped and tightened. From a sizing perspective it sits a little high on my waist, but I’m 6’3” so I have a feeling I’d be hard pressed to find a structured carrier that fits me properly. Even riding high it is comfortable enough to wear for hours. When I was first looking at carriers it made sense that they would be so expensive. It’s a little backpack for your baby, and anyone who has gone hiking knows that comfort costs when it comes to backpacks. 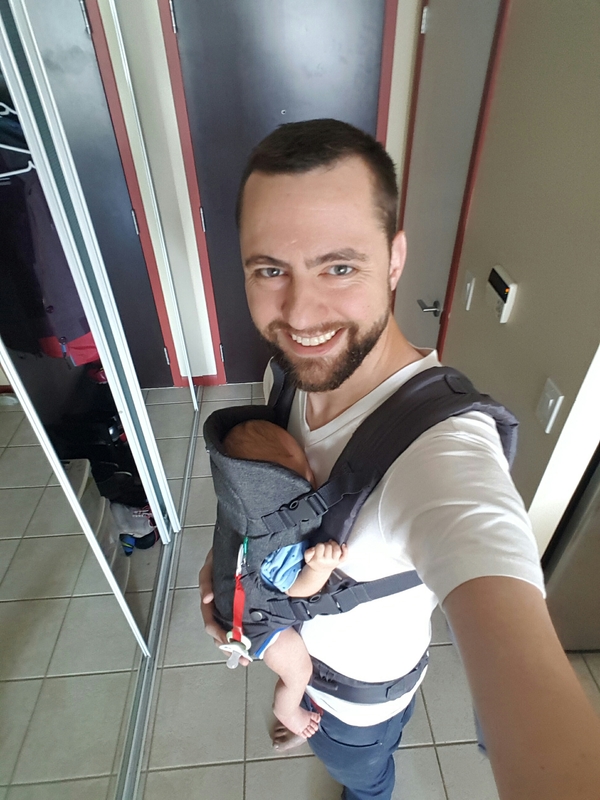 But then I came across the Infantino – less than half the price of the original Baby Bjorn, and much more versatile than the Evenflo (which doesn’t look like it can hold a candle to the support and comfort of the Infantino). At $44.97, you can’t go wrong! 100%. This is probably my favorite bit of kit for the Wee Baby T. Plus, the potential for Halloween costumes is endless!! What is your carrier of choice? What questions did you ask when you were picking out your hands-free carry solution?